Musings 'n scribblings of a philanthrope .. : NASA GRACE mission and dwindling global freshwater reserves . NASA GRACE mission and dwindling global freshwater reserves . The 2002-2016 NASA and German Aerospace Center joint collaboration project, GRACE Mission (Gravity Recovery and Climate Experiment) has found 34 regions around the world where an approximate amount of 32 billion tonnes of fresh water has moved out from the dry middle latitudes showing multiple areas of growing dryness while higher latitudes and tropical belt regions see an increase in fresh water reserves. This shift as observed by the GRACE mission is not due to climate changes but human induced actions like massive blocking and redirecting of rivers and other actions (for eg. unplanned ground water exploitation). Northern India and Northern China has seen massive drying of water storage systems over the past fifteen years of the study..
Has global population been playing an interesting role in this depletion ? 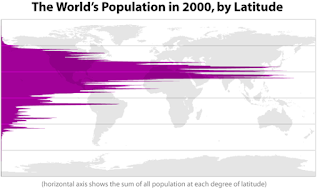 The two pics show the distribution of population across the world, latitude wise and longitude wise (the world map is in the background). About 88% of global population live in the northern hemisphere, with about half north of 27 deg N latitude and the other half south of this latitude. Similarly we find, more than 50% of the global population live between 60deg E and 120deg E longitude. 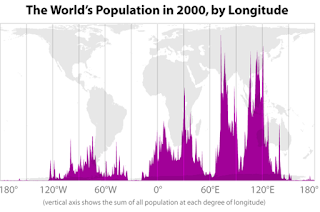 The fresh water availability problem will exacerbate especially in the Northern hemisphere and between 60 and 120deg E longitude, when global population from the present 7.6 billion grows to 8.6 billion by 2030, 9.8 billion by 2050 and 11.2 billion by 2100 at approx. 83 million every year or 2,27,400 every day !! (UN 2018 data, medium projections).